A colourful – though overly familiar - apocalypse in which to run amok. 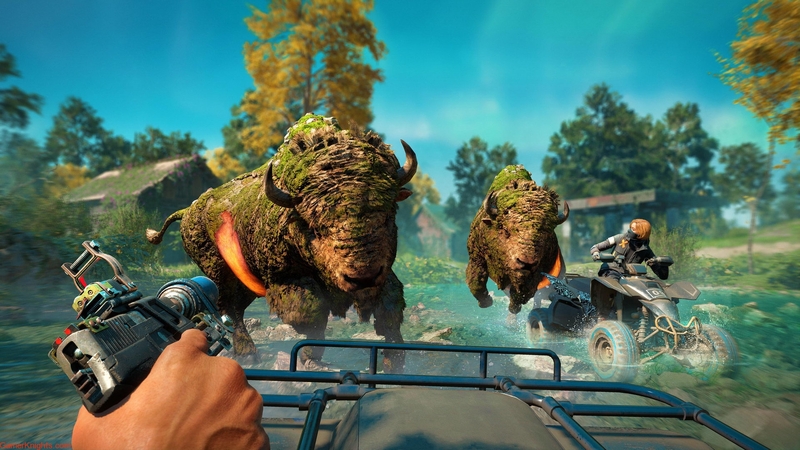 I found FarCry 5 a lot of fun – safe evolution though it was. It was a gorgeous open world with nice quality of life improvements over its predecessors – but I found its promising story to be a bit toothless. New Dawn is a direct sequel to the apocalyptic events of that game, and whilst it doesn’t fall into the dull, dreary ditches a lot of this genre so often gets caught up in, it can’t save itself from feeling a little too familiar to FarCry proper. Hope County, Montana, is a different place than you might remember – though not too different. 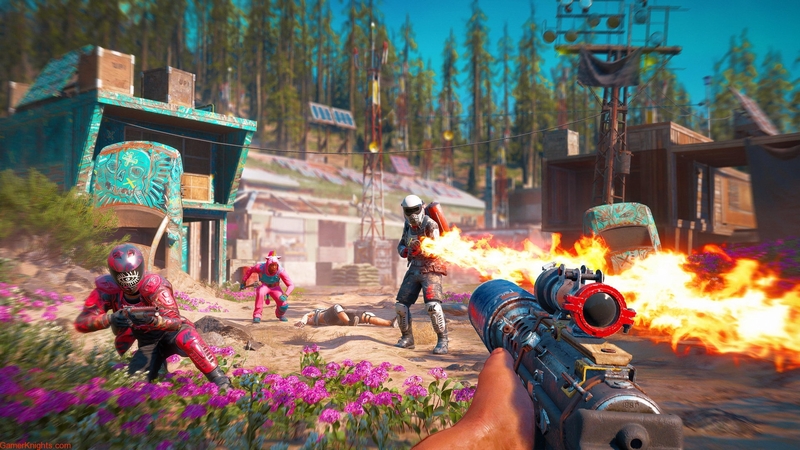 Seventeen years after the climactic moments of FarCry 5, the familiar map from that game has made a comeback – albeit with a slightly more verdant (and pink!) look. Thematically the game looks tight, it’s got a style and flair all its own that separates it from other games in the series. This is important, because if you’re not paying attention you might think you’re playing any other FarCry game. There’s a fairly by-the-numbers story here, with not one but two villains who walk the line between ‘genius and ‘absolute nutcase’ a little less delicately than those who have trod their path before. Twins Mickey and Lou are well designed and could have been a great addition to FarCry’s stable of crazy, but they end up falling a bit flat. Yes, the series isn’t the most experimental – it knows what’s fun and sticks to it. For the most part, that formula works here as well as ever. Liberate outposts, complete sidequests, build up an arsenal of awesome guns, bases and clothing, and hunt (irradiated) wildlife – all in an effort to liberate the County once more from nutters with an axe to grind against civilized society. The core loop here is as engaging as ever, with plenty of carrots on plenty of sticks to get you to keep coming back and working towards area completion. 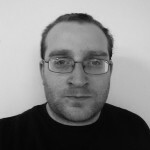 The shooting and looting is rewarding and addictive, and the challenging ante-upping of outposts meant there was always a new bunch of badguys to test myself against – usually wielding more intimidating weaponry. 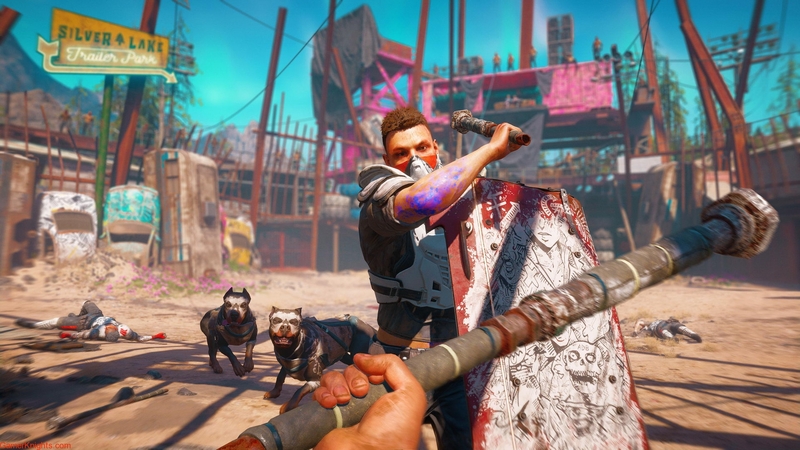 If you’ve never dug a FarCry game before, New Dawn isn’t going to change that. It doesn’t reinvent the wheel – indeed, it barely iterates on the wheel – but series fans will find a lot to love here. There’s no shortage of things to do and the new expedition mode mixes things up in really fun ways – and most importantly gives us a few new areas to explore, rather than the reskin of the old map. That said, the reskin is fun. Recognizing old areas from FarCry 5 is neat, especially seeing how the seventeen years has treated it (though usually it just means more overgrown and dilapidated. Still, remembering old showdowns I had – and having brand new ones – in familiar locales brought a smile to my face. It all looks nice enough – especially for a budget release – but that’s what you get when you’re throwing new colours on an already pretty face. The sound design is excellent too, with some of the new guns sounding especially chunky and satisfying. The voice acting is hit or miss, but for the most part everything sounds great.